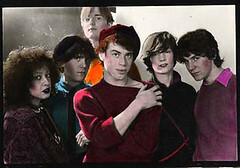 Up till now, our footage of DNA at the Mudd Club was as close as you were going to get to reliving a night at the legendary Tribeca club frequented by Warhol, Haring, Lou Reed, David Byrne, Lydia Lunch and pretty much everyone else who was anyone in downtown New York between 1978 and 1983. But on Nov. 19, you’ll have a chance to experience something close to it. The WSB100, a month-long celebration of William S. Burroughs’s centenary, just announced that Cinema of Transgression pioneer Nick Zedd has joined a lineup that already included Steve Buscemi, Genesis Breyer P-Orridge, Thurston Moore, John Zorn, DJ Spooky, JG Thirlwell, and many more. Pat Ivers and Emily Armstrong are sifting through their voluminous archive of punk-era concert footage as it’s digitized for the Downtown Collection at N.Y.U.’s Fales Library. Here’s this week’s trip down memory lane, starting with a word form Jeff Magnum, bassist for the Dead Boys.